The BIM Toolkit allows the administrator of a project to invite other team members to access the project as ‘contributors’. Contributors may not edit the main items in the plan of work, but they do receive web-access to the project and can post comments against tasks and deliverables. This allows the digital plan of work to become a reference source that can be used by each member of a collaborative project team on a daily basis. See Collaboration - Contributor for more details about contributor permissions. How do I invite other users to my project? 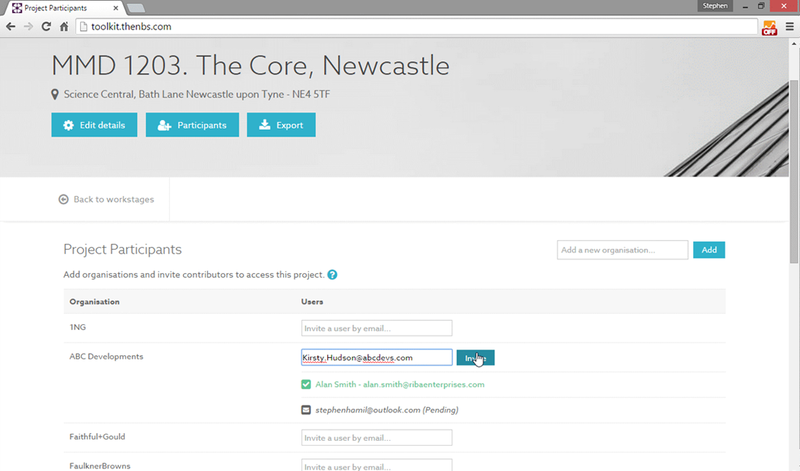 You can invite a user to your project by adding there email address on the participant’s page. Invited users will receive an email invitation the project. For more information on how to do this see the Defining Participants page. How can I remove a participant from my project? To remove a participant see the Defining Participants page. Can I share my project with non-NBS account users? Yes, you can invite people without NBS accounts to your project, however to access the project they will need to register for a free NBS user account.